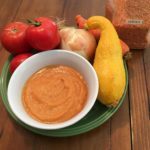 Tomatoes, yellow squash, onion, carrot….a great soup for the end of summer harvest. The blended red lentils make it creamy and add additional protein and fiber. I tried Jane’s soup recipe. It is absolutely delicious, so I posted on Facebook. Glad you enjoyed the soup! We enjoy it too in our home. I am reading your newsletters regularly and trying to follow most of your recommendations, but I am discouraged about not losing any weight. I am 65 years old and need to lose about 30 pounds, but in spite of eating only whole grains, rice, and pasta and eating 10-15 different fresh fruits and vegetables every day and very little meat, I cannot seem to get the scales to go down. I mostly eat dark chocolate (60-85%)for my dessert. I only use olive oil to cook with and eat raw nuts and seeds for snacks. I never drink pop or milk–just water, and I walk one hour a day and do 20-30 minutes of stretching most mornings. I was thin and energetic until I was 40. Then the pounds started creeping on even though I did not change the amount I was eat eatubg. I grew up on a farm, so have always liked and eaten a lot of fresh vegetables and unprocessed foods. Even though I had eight children, I maintained my marriage weight throughout these years. It was at around 40years old when I had a lot of stress due to the illness and death of children that my weight started to increase and it seems to be slowly continuing. I have always had a big appetite, but I try to eat small healthy meals most of the time, and do not stuff myself. I even tried going on a 1500 calorie diet 2 years ago for six months, and only lost 5 pounds. Are there people who really can’t lose weight? I cannot figure out what I am doing wrong. I feel healthy and have quite a bit of energy for my age and am able to work 8-10 hours a day. My cholesterol numbers are high, but I have no diagnosed health problems and only take something to help me sleep–no other medications. I have a check up every year and continue to try to live a very healthy lifestyle, but I am discouraged because of my weight and how I look. I was always a skinny person and I do not like how I look or feel with the extra 30 pounds. Who can I do? Yes, it can be especially challenging for some people. Some people have genes that cause them to hold onto every calorie. Don’t give up hope. When you look at traditional cultures, obesity just did not exist. Obesity is something that was only seen among the nobility in ancient times. As our genes have changed little, there is hope! For people struggling with weight issues, eliminating all sugar and processed carbohydrates works for about 90% of people. For the other 10%, you may need to significantly reduce or eliminate even processed grains. Also, even if your diet is 100% healthy, if the portion sizes are too big for your metabolism and activity, you won’t be able to lose weight. For many of my patients, tracking has been critical in losing or maintaining a healthy weight. Also, when you look at studies, most people who can maintain weight loss exercise vigorously at least an hour a day.